It’s Monday, and here’s another round of “Meatless Monday” meals for you to give a try! 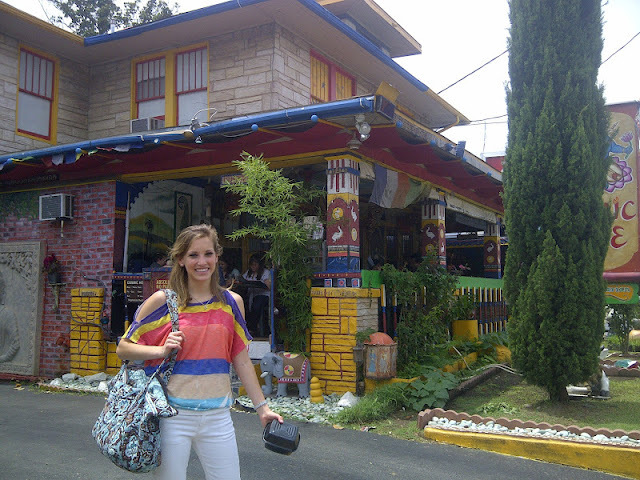 Has anyone ever eaten at Cosmic Cafe in Dallas? Supposedly it’s the best vegetarian restaurant in Dallas-Fort Worth and Dallas Observer has rated it the “best vegetarian restaurant” for the last 9 years. Last Friday it was my coworker’s birthday, so we all took her to lunch at Cosmic Cafe. I’ve heard from Dallasite coworkers that this is a great place. Even though I’m not vegetarian, I still wanted to try it out! From the looks of it, Cosmic Cafe is definitely unique. The entire building is painted in vivid/bright colors that made me feel like I was walking back into the flower child years of the 60s and 70s…or at least made me feel like I was in Austin, not Dallas! Lunch was actually pretty good. Our group started out by ordering the hummus plate, which consisted of garbanzos, garlic, tahini and lemon juice, served with nan. It was excellent. The hummus was very creamy and the nan was pipping hot…it tasted like they had just baked it fresh from the oven. For my main meal I ordered the “no bull burger”, which is a black bean burger topped with mushrooms, onions, lettuce and tomato, topped with melted swiss on a whole grain bun. It was delicious. What else is good at Cosmic Cafe? The “portabella trance” was highly recommended and contains portabella mushrooms, spinach and onions sauteed in a garlic-basil butter, all rolled up between cream cheese, tomatoes and nan. If you’re looking for something sweet, you might want to give “sweet awareness” a try. It contains peanut butter, banana, tahini and honey served on nan; but ask to substitute strawberries for banana! Overall, I thought Cosmic Cafe was pretty good and I would be back. I must say, you better be pretty adventurous to try this place out….I guarantee you thatI couldn’t get my husband to eat at this place even if I paid him! It’s definitely not his “type” of restaurant! 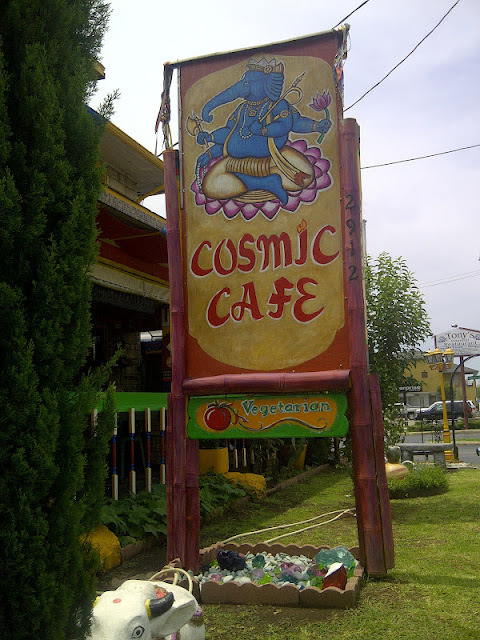 Have you ever been to Cosmic Cafe? If not, would you be adventuresome and try it? What other vegetarian restaurants do you recommend? One Response to "Meatless Mondays at the Cosmic Cafe"
Looks like a fun spot! 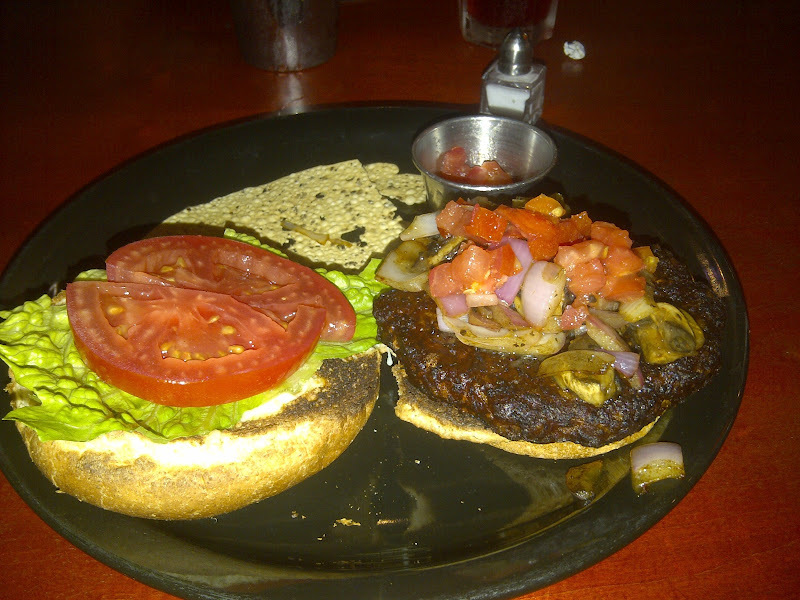 I’m not a vegetarian, but love veggie or black bean burgers and that one looks delicious!